Armin joined the Federal Armed Forces (Air Force) in July 1983 and was trained as an electronic warfare und reconnaissance Officer and IT-Officer. Holding increasingly senior roles until 2015 he became deeply involved in the build-up of the new cyber and information domain responsible for the new MOD Division for Cyber/IT in Berlin and Bonn. 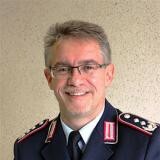 With the announcement of the new Cyber Information Domain Command in April 2017 in Bonn, Armin became the designated Division Head of the planning division. Check out the incredible speaker line-up to see who will be joining Armin .